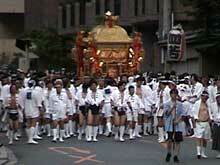 Gion Matsuri, or Gion Festival began in the tenth century and is held from July 1 to July 31 every year. There are more than ten events held during the month of the festival. The most famous event among them is Yamaboko Junko where Yamaboko floats parade slowly in central Kyoto in the morning of July 17. Another event, Shinko-sai, held in the evening of the same day, is more wild and masculine. It is not so famous as Yamaboko Junko but my opinion is that you should see it if you visit Kyoto to see Yamaboko Junko. In the Eve of Yamaboko-Junko, they display decorations of Yamaboko for closer look.